Hi Guys! I hope that you had the most awesome Thanksgiving! Ours was so funny. We were supposed to have to go back to Canada for Coco’s work on Thursday so my family very generously decided to celebrate a day early on Wednesday with us and my mom said she would host (I have been hosting for the last 10 years.) Well as we were driving to my mom’s for dinner I got a call that Coco didn’t have to be in Canada until Sunday. Insert crying/laughing emoji face here. In the end it was so great- we still had a very normal Thanksgiving dinner and we bought ourselves an extra day of lounging. And I do mean seriously being couch lizards. Like I watched a dozen movies this weekend already and it’s only Saturday. I have been sleeping a ton too. If you watch my insta-stories then you will know I hit my head on a car door two weeks ago and have had a concussion that I feel like I have finally healed with all of this rest. Ok, so now onto the good stuff- the food. If you have been anything like me this weekend, you are just lounging around and now the leftovers have dwindled and you might be ready to make something of your own. You also might be in the middle of on-line shopping. This post addresses both! The first is Pork Pumpkin Thai Curry which is exactly what you want to be eating while watching old movies tonight. It’s made with ButcherBox Heritage Pork, which is awesome. And if you are in the middle of a digital shop-a-thon (like me) today then you should check out ButcherBox. It’s one of my new obsessions so I have to share. Life has gotten so complicated for me these last few months and ButcherBox is hooking me up with great quality meat delivered to my door! so that is one more thing I can take off my plate-um yes please. Check it out- I am buying ButcherBox as a really nice gift for two different family Members that are impossible to buy for but that are obsessed with keto- perfect gift right!? 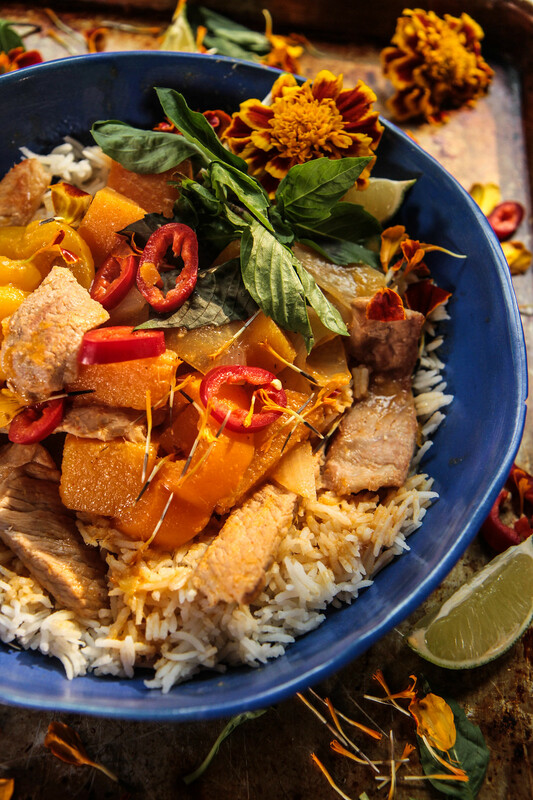 Ok, without further adieu: Pork Pumpkin Thai Curry! Add 1 tablespoon of coconut oil and the pork pieces to a hot pot, lightly sear on both sides and then remove and add the curry paste ingredients. Puree in a blender with a ¼ cup of the broth and add back to the pot. Add the second tablespoon of coconut oil and add the onions, pumpkin and peppers to the pan. Then add the pork and the broth and whisk in the coconut milk. Bring the whole pot to a simmer until hot and season to taste with kosher salt. 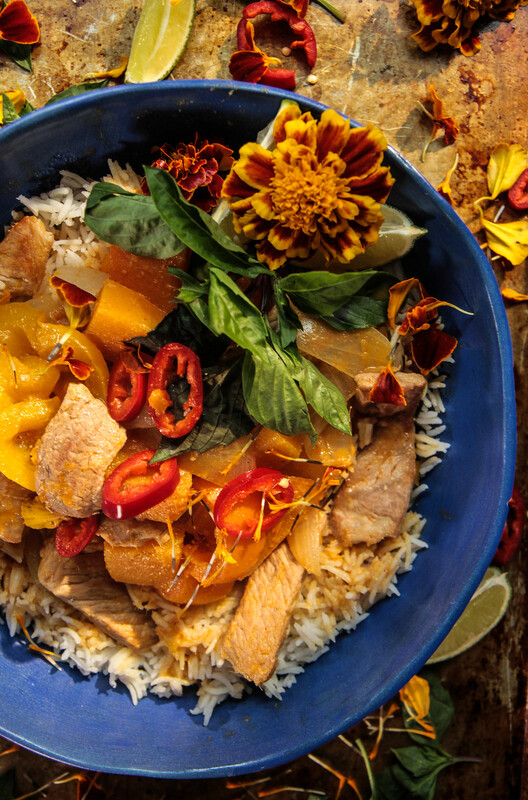 Serve over steamed rice and garnish with fresh Thai Basil, red fresno chili’s and a wedge of fresh lime. Glad you got an extra couple days of rest! This curry looks fabulous. I definitely want to check out Butcher Box! Insane flavors going on, I bet it smells amazing! This dinner has my name written all over it! Looks fantastic!